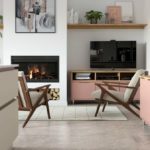 In recognition that the kitchen is often an extension of the living space, Masterclass Kitchens has introduced a range of freestanding furniture to connect the kitchen with other areas of the home. Catering for multi-functional family lifestyles and open-plan living, The Living Collection comprises a range of freestanding pieces. Two styles options are offered: Classic Freestanding and Modern Freestanding. Classic features a coffee table, side table, sideboard and dresser. Available with an option of the Masterclass Marlborough or Hampton silk finish doors, the Classic Freestanding furniture can be chosen in a palette of 25 painted colours. The cabinet and worktops come in either Portland Oak or Tuscan Walnut, for quality throughout each piece of furniture. The Modern Freestanding range includes configurations available in five Masterclass door options – Sutton, Madoc, Lumina, Larna and Deco. The Modern range consists of a coffee table and a sideboard, with 11 cabinet colour options and 26 painted colours. Each piece in the Living Collection comes in a choice of widths and in various door and drawer configurations.